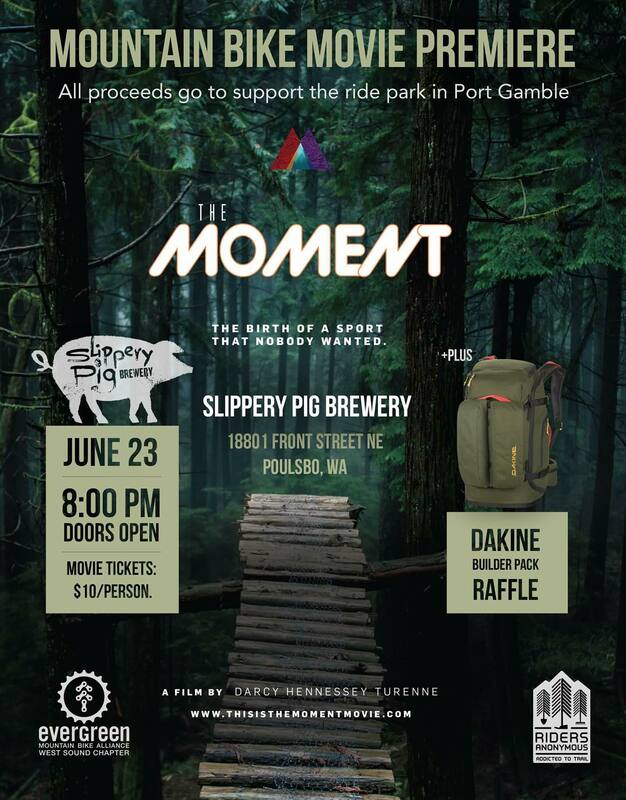 Evergreen West Sound has teamed up with Riders Anonymous and Slippery Pig Brewery to host a movie night! Money is being raised for the Port Gamble Ride Park. In the past 20 years, the sport of mountain biking has transformed from being a fringe activity in the outer reaches of the outdoor community, to a wildly popular sport with hundreds of millions of participants globally. From Nepal, to Macedonia, to Indonesia, it’s virtually impossible to find a place in the world that does not have a core following of mountain bikers. But it didn’t have to be this way. In fact, in the early 90’s when our story takes place, most of the mountain bike industry was happily stuck in an insular bubble of race-centric exclusivity. Mountain biking was setting itself up to be just another action sports fad. And then the moment happened. This film is the origin story of a small movement of mountain bikers who rose up, challenged the status quo, and changed the sport in ways that can be seen in every aspect of mountain biking today. From technology, to media, to fashion, to the creation of a multi-billion dollar industry, this small, dedicated crew of adventure seekers from the backwoods of British Columbia, Canada, were quietly and unknowingly carving their path in history. The momentum they created from pushing themselves and their bicycles harder, steeper, and faster sent a wave into the action sports world that still has not slowed to this day. This film is about the tipping point when freeride mountain biking became a global sports phenomenon, and the people who were passionate enough to make it happen in the face of industry adversity, injury, and heartache. This is a story that has never been told, told by the people who lived it firsthand. This is the story of the moment that changed everything.